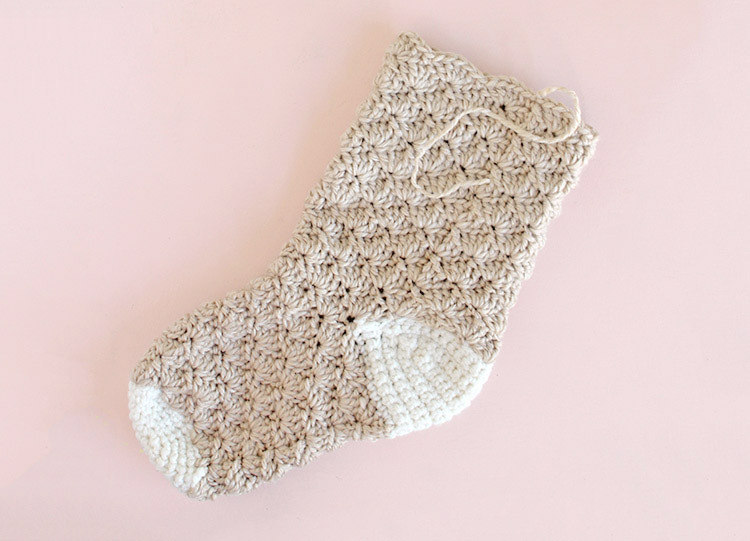 Learn how to make your own beautiful crochet Christmas stocking with this free pattern! This pattern makes an heirloom quality stocking that can be treasured for years to come. I have a written pattern with photos to help PLUS a video tutorial to help you through. 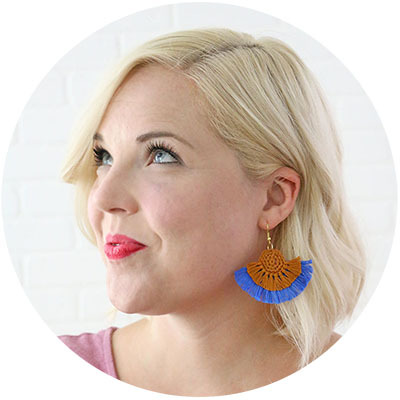 I originally shared this pattern at Crafts Unleashed, and this post contains affiliate links that help to support this site at no extra cost to you. Thanks! I can’t believe we are already a whole week into December! How did that happen?? 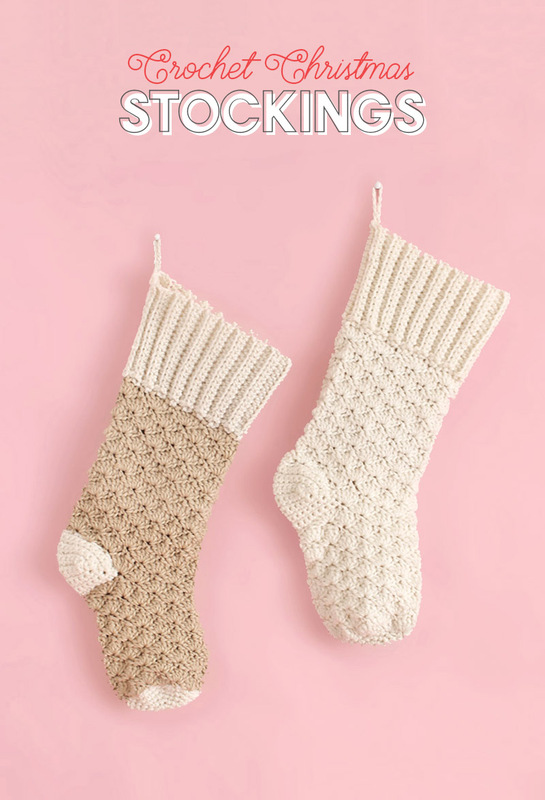 We are definitely moving quickly towards Christmas, but you still have time to crochet yourself or someone you love one of these pretty Christmas stockings, and I hope you will! I love the way these pretty stockings turned out, and I know you will love them too. First though, let’s talk about this stocking for a second, ok? I know I’m biased, but I happen to think this thing pretty great. It is worked toe up, in the round, until you get to that ribbed cuff. I worked the body of the stocking in a shell stitch, which is probably my favorite stitch pattern. And then that ribbed cuff. 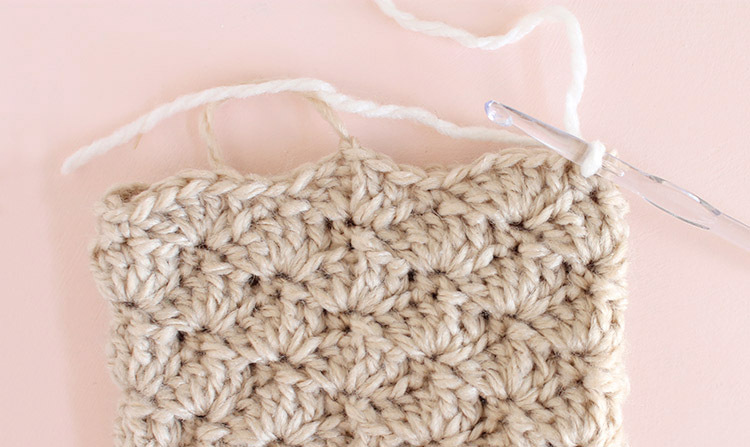 I also love a good ribbed stitch. You can work this stocking in a solid color or in two colors so the toe, heel, and cuff contrast with the body of the stocking. It’s up to you! They both look great. 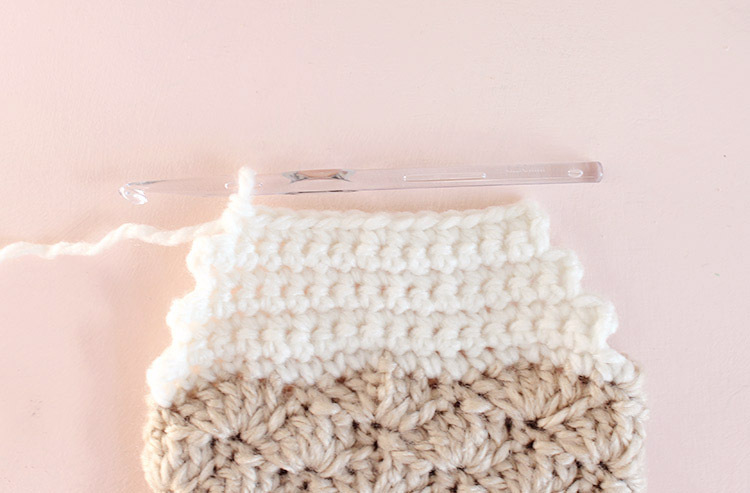 🙂 Ready to get crocheting? Note about yarn and sizing: The white and tan stockings I made with Darice Folklore turned out a bit smaller (21 inches long) than the navy stocking I made with Loops & Threads Charisma (23 inches long. This is because that yarn is a lighter weight #5 bulky. I used a size K hook for both. 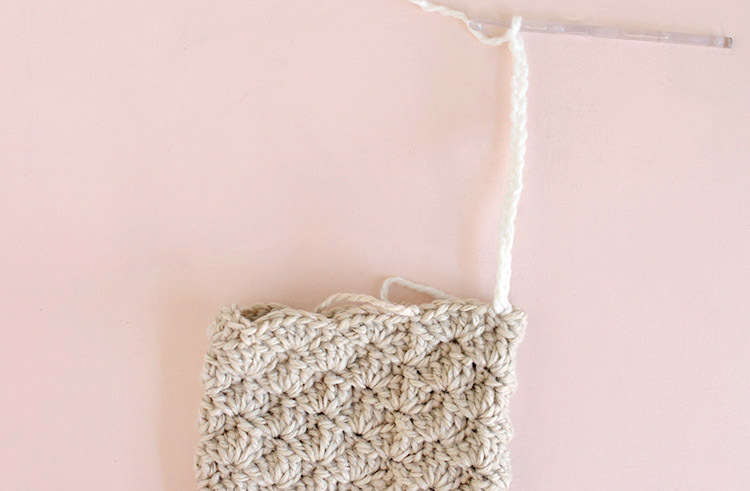 You can try this pattern with a #4 worsted weight yarn and appropriate hook, but it will result in a smaller stocking. Rnd 2: Ch 1, 2 sc in same st, 2 sc in each st around, sl st to join (14 sc). Rnd 3: Ch 1, sc in same st, 2 sc in next st, *sc, 2 sc in next st, repeat from * around, sl st to join (21 sc). Rnd 4: Ch 1, sc in same st, sc, 2 sc in next st, *sc, sc, 2 sc in next st, repeat from * around, sl st to join (28 sc). Rnd 5: Ch 1, sc in same st, sc, sc, 2 sc in next st, *sc, sc, sc, 2 sc in next st, repeat from * around, sl st to join (35 sc). Rnd 6: Ch 1, sc in same st, sc, sc, sc, 2 sc in next st, *sc, sc, sc, sc, 2 sc in next st, repeat from * around, sl st to join (42 sc). For solid color stocking, continue with same yarn. For two-toned, finish off Color A and weave in ends. Rnd 7: Join Color B where you finished off the last round. Ch 1, sc in same stitch, *skip 2 sts, 5 dc in next st, skip 2 sts, sc, repeat from * around leaving off last sc, sl st to first sc to join (7 5 dc shells). Round 8: Ch 3 (counts as dc), 2 dc in same st, sc in center dc of next shell, *5 dc in next sc, sc in center dc of next shell, repeat from * around, work 2 dc in same st as beg 3 dc, sl st to top ch of the beginning ch 3 to join (7 5 dc shells). Round 9: Ch 1, sc in same st, *5 dc in next sc, sc in center dc of next shell, repeat from * around, sl st to beginning sc to join (7 5 dc shells). Rounds 10 – 18: Repeat Rows 8 & 9. For solid color stocking, continue with same yarn. Finish off. Weave in ends. Row 1: Join Color A 9 stitches to the right of where you finished the previous round (see image below). Ch 1, sc in same st, sc in each of next 18 sts (19 sc). Turn. Row 2: Ch 1, sc in same st, sc in next 17 stitches (do not sc in last stitch of previous row) (18 sc). Turn. Row 3: Ch 1, sc in same st, sc in next 16 stitches(do not sc in last stitch of previous row) (17 sc). Turn. Row 4: Ch 1, sc in same st, sc in next 15 stitches (do not sc in last stitch of previous row) (16 sc). Turn. Row 5: Ch 1, sc in same st, sc in next 14 stitches (do not sc in last stitch of previous row) (15 sc). Turn. Row 6: Ch 1, sc in same st, sc in next 13 stitches (do not sc in last stitch of previous row) (14 sc). Turn. Row 7: Ch 1, sc in same st, sc in next 12 stitches (do not sc in last stitch of previous row) (13 sc). Turn. Row 8: Ch 1, sc in same st, sc in next 12 stitches, sc in side of previous row, sc in st below, sl st to side of row below that (see image below – the work curves where you work stitches into the side of the previous rows) (15 sc). Turn. Row 9: (Do not ch) Sc in next 15 sts, sc in side of previous row, sc in st below, sl st to side of row below that (17 sc). Turn. Row 10: (Do not ch) sc in next 17 stitches, sc in side of previous row, sc in st below, sl st to side of row below that (19 sc). Turn. Row 11: (Do not ch) sc in next 19 stitches, sc in side of previous row, sc in st below, sl st to side of row below that (21 sc). Turn. Row 12: (Do not ch) sc in next 21 stitches, sc in side of previous row, sc in st below, sl st to side of row below that (23 sc). Turn. Row 13: (Do not ch) sc in next 23 stitches, sc in side of previous row, sc in st below, sl st to side of row below that (25 sc). Finish off, weave in ends. Round 1: Join Color B in the fourth stitch to the right of where the heel meets the foot of the stocking (see image above). Ch 1, sc in same stitch, skip 2 sts, 5 dc in next st (first sc on the heel portion), skip 2 dcs, sc in center dc of next 5 dc shell, *5 dc in next sc, sc in center dc of next 5 dc shell, repeat from * twice, 5 dc in first sc of heel, skip 2 sts, sc in next st, **skip 2 sts, 5 dc in next st, skip 2 sts, sc, repeat from ** twice, leaving out last sc stitch, sl st to beginning sc to join (8 5 dc shells). Round 2: Ch 3 (counts as dc), 2 dc in same st, sc in center dc of next shell, *5 dc in next sc, sc in center dc of next shell, repeat from * around, work 2 dc in same st as beg 3 dc, sl st to top ch of the beginning ch 3 to join (8 5 dc shells). Round 3: Ch 1, sc in same st, *5 dc in next sc, sc in center dc of next shell, repeat from * around, sl st to beginning sc to join (8 5 dc shells). Rounds 4-15: Repeat Rows 2 & 3. Finish off, weave in ends. 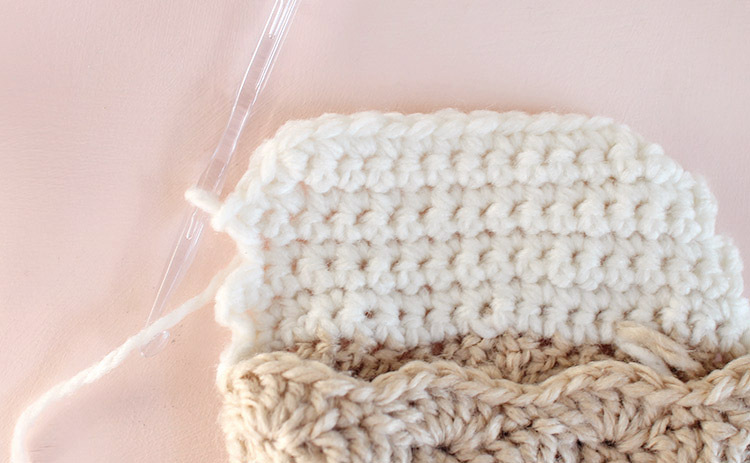 Row 1: Join Color A to any stitch along the back (heel) edge of leg. Ch 1, sc in same st, ch 18, hdc in 3rd ch from hook, hdc in each remaining ch (16 hdc), sl stitch in next two stitches along stocking edge. Turn. Row 2: (Do not ch) Hdc in the back loops only of each hdc of previous row (16 hdc). Turn. Row 3: Ch 2, working in back loops only, hdc in same st and each stitch across (16 hdc), sl stitch in next 3 sts in edge of stocking. Turn. 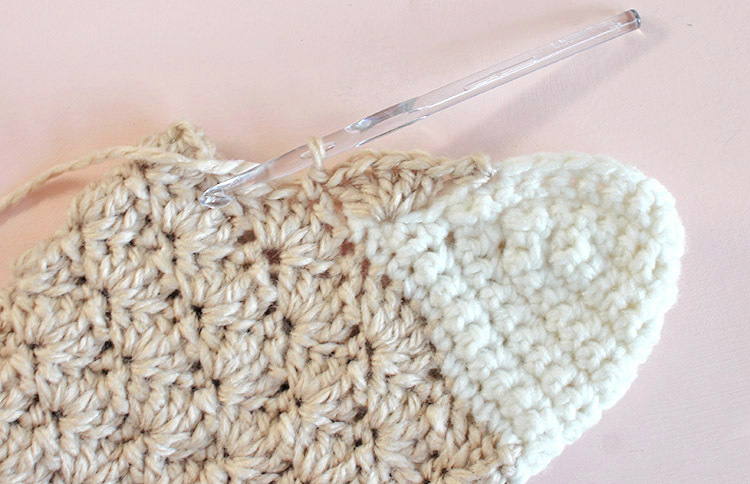 Continue working in this pattern, crocheting half double crochet stitches in the back loops only of the cuff portion and alternating two and three slip stitches when joining to the stocking edge, until you go all the way around the stocking edge. Then slip stitch through the last row of the cuff you worked and the chain of the beginning row to sew up the ribbed cuff. 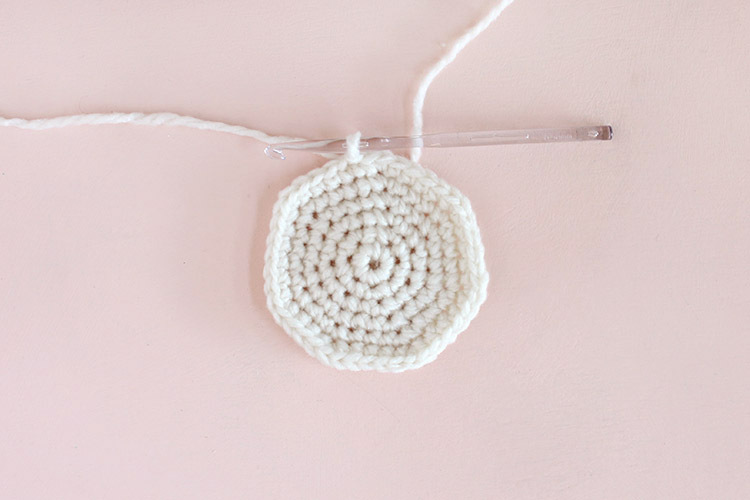 Finally, finish off your stocking with a loop for hanging. Ch 1, sc in the cuff edge, ch 1, sl st through sc just formed. Finish off. Weave in ends. Ta-DA! 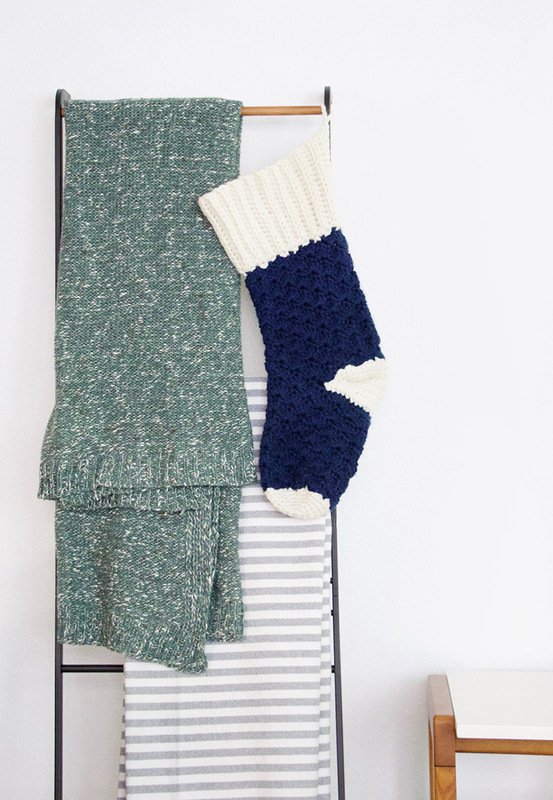 Your stocking is all done and ready for Santa to fill it with goodies. Our new home doesn’t have a fireplace, so this year I have just hung some stockings on our blanket ladder. I’m kind of loving it. Oh! I almost forgot the video! You can watch it below, and I would love it if you subscribed to my youtube channel. These are beautiful! This is just the sort of stocking I wanted to make last year, but couldn’t find a pattern for. Are you okay with people making the stockings to sell? I wasn’t sure if by “please don’t sell the pattern” you meant the pattern itself or the stocking? Love this pattern. I made 6 of them for our mantle. Would love to share the photo, but I’m not sure where to post it. The heel was tricky, I may have ripped it out quite a few times before finally figuring it out, but I’m glad I persevered. 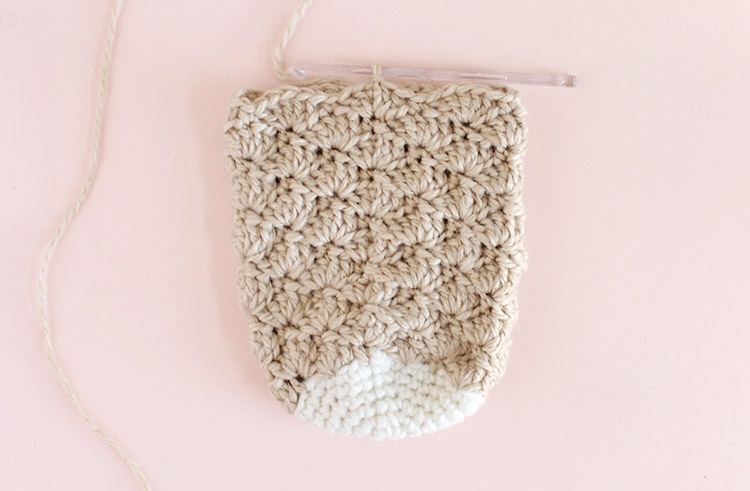 Thanks for sharing the pattern! 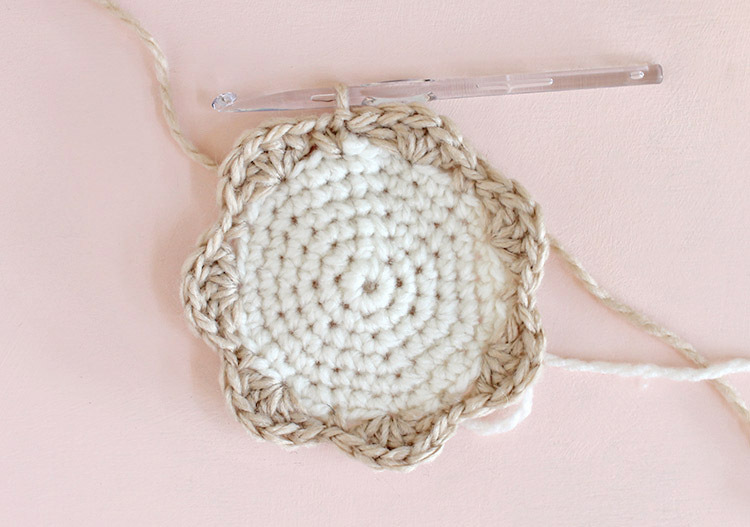 I can hardly wait to get started on these I have about 17 to 20 to make! 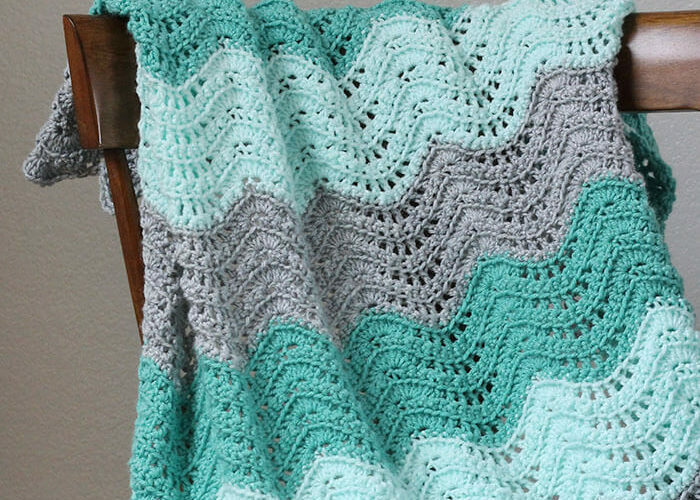 THANK YOU SOOO VERY MUCH FOR THIS PATTERN ,I AM SO HAPPY TO HAVE FOUND YOUR WEBSITE. I love this pattern, I am wanting to make quite a few smaller versions for nieces and nephews. 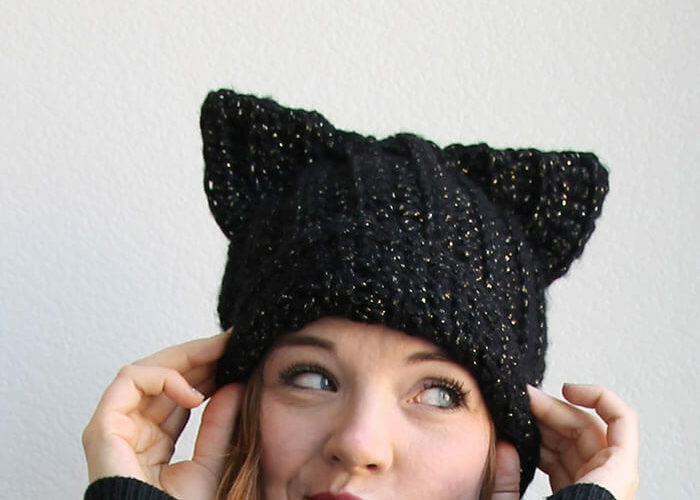 Can you suggest a way to adjust the pattern to half the size. Would it be as simple as half the number of stitches ? Thank you so much for this pattern!! I have looked everywhere for something just like this. You’re video was so helpful and easy to follow! I made 10 of these in the last two months for our large family and our kids were so excited watching them come together! I chose a really bulky yarn and they are huge!! I think they are dreaming about all the goodies to fill them. 🙂 Thanks again! So dang cute❣️ Now I just need to learn to crochet. How did I not know you had a YouTube channel, headed there now. These are so cool! Thanks for posting. Wondering if you can help me? 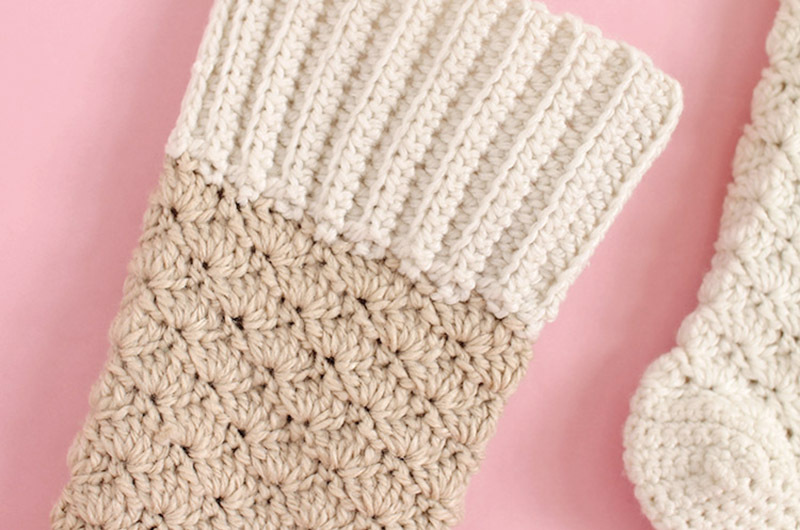 I’ve been looking for a slouchy sock pattern in crochet. We are making them for our local Cancer Care Center. The pattern needs to be easy as some of the women in our church charity handcraft group are beginners. Any suggestions? Can this one be adapted to serve my needs? If so, how? Any suggestions on how to put names or letters on them?